Eligibility: Open to all Potomac Valley Swimming registered athletes. Also, open to registered athletes of invited USA Swimming clubs. Clubs interested in participating should request an invitation from the PVS Senior Chairman, Riley Eaton at 301-367-2819 or jreaton@verizon.net or the PVS Age Group Chairman, Bill Marlin at 571-334-0987 or coach_bill@verizon.net. Swimmers shall compete at the age attained on the first day of the meet. It may be necessary to limit entries due to time constraints. Positive Check In: All events 200 Meters or longer will be deck seeded. The Meet Director will determine if positive check-in will be required for any events of 100 meters or shorter. Athletes who check in to a deck-seeded event, have been seeded, and fail to swim the event will be barred from their next scheduled individual event, unless excused by the Referee before the event takes place. 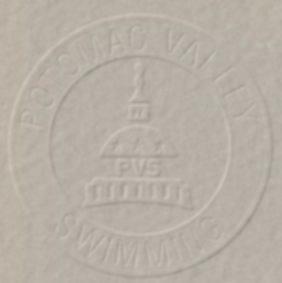 Warm-up: The prescribed Potomac Valley Swimming warm-up procedures and safety policies will be followed. The Meet Director may determine the structure of the warm-up, including times and lane assignments. Officials: Each participating club is requested to provide at least one table worker or official (referee, starter or stroke and turn judge) per session if entering 25 or more splashes. All certified officials wishing to volunteer to work this meet please contact the appropriate club officials chairman or meet referee as shown above prior to June 3. Please include your club affiliation, certifications held and sessions you wish to work. Officials volunteering should sign in at the recording table prior to the start of Warm-ups. Certified officials who have not previously advised of their availability may volunteer their services to the Referee at this time. Timers: Participating clubs are required to provide timers in proportion to their entries. A timer is required for each 25 entries. The number of timers being committed must be included on the club master entry. The number of timers required will be adjusted when club is providing other officials. Acceptance of the club entry is based upon compliance with the above. Host clubs are required to provide one timer per lane. Admission/ Programs: There is no admission charge. Programs for each session will be available for a price not to exceed $2.00 each. Working officials and coaches receive a free program. Concessions: There will be no concessions available for athletes and spectators at this meet. Awards: There are no awards at this meet. Fees: Fees for individual events are $3.75. Entries should be submitted using Hy-Tek Team Manager via e-mail. Events for this meet can be downloaded at 56mm061508.zip . Include in the e-mail subject heading "2008 PVS Sr/Age I - ****" with the club's initials substituted in place of the asterisks. Also include training site if your club submits multiple entries and number of timers being committed. Each club is requested to remit one check via USPS to cover the entry fees for the entire team. Please put the club name on the entry check (if not a club check), the number of entries, and the meet name or sanction number on your check. Please do not send cash. Meet directors have been instructed not to accept telephone or fax entries. Late/Deck Entries Late (deck) entries are $10.00 per individual event and must be submitted no later than 45 minutes prior to the first event of each session. Swimmers will first be entered into open lanes in existing heats on a first come, first served basis. In the event of a significantly over subscribed session, the Meet Director reserves the right to not accept deck entries. Evidence of current USA-S registration will be required for deck entries. This can be done by presenting a copy of the athlete's USA-S athlete's registration card. 5:00 p.m., Tuesday, June 3, 2008. NOTE: Assignments of clubs to pool sites will be reviewed after entries are received. If necessary to achieve reasonable balance, clubs may be reassigned.